Ambient. A dictionary will tell you it’s an aspect of the environment that completely surrounds you, like the glow of the sun or the flavours of the food you’re consuming. And that’s exactly how we’ve designed our ambient range. We want our food products to permeate our customers’ meals with full flavours and zesty aromas, complementing wider menu plans and infusing their cuisine with richness of texture and taste. What is ambient food? In a nutshell, it’s convenient food that can be used as part of more complex food products. For example chopped garlic which can be added to gravies or sun-dried tomatoes for sauces. They are a vital component for commercial kitchens working in large-scale food production, and they make life easier for busy chefs. Based in Portsmouth, on the South coast of England, Quattro Foods is one of the UK’s leading food manufacturers, supplying the retail, wholesale, food service and restaurant sectors. A close-knit team, dedicated to serving our customers and passionate about food, we combine premium ingredients with unparalleled expertise and creativity to offer delicious, cost-effective and convenient food products. 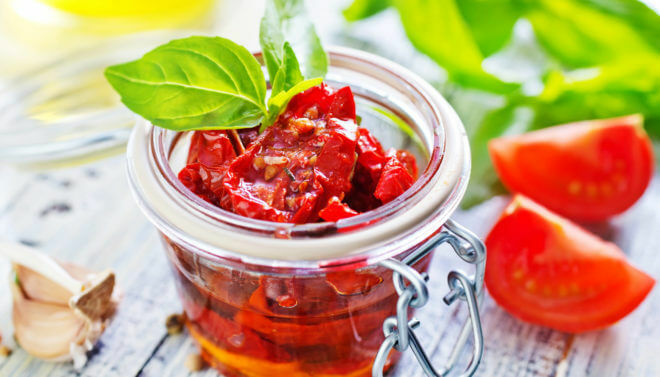 One of our most popular product ranges is our ambient range which includes garlic; sun dried tomatoes; ready to use sauces; pesto and salad dressings. These products are designed to enhance our customers’ menus and meals. Commercial kitchens looking for delicious and convenient sauces and food products to complement their culinary offerings turn to us for our outstanding and ever-changing range of ambient products. Our secret is simple. Our chefs are passionate about food and understand how to improve a filet of fish, a chicken breast or a plate of pasta with creative concoctions of vegetables, herbs and spices – turning a simple plate into a mouth-watering delight. Our ambient range is ideal for our customers in every way. Restaurants, wholesale and retail food businesses are always looking for supreme taste and ultimate convenience. What makes the products work so well is that they are designed by chefs for chefs. The experienced kitchen staff at Quattro Foods knows exactly what makes a fellow chef happy – a tasty product which helps them create their menu solutions without compromising on quality. Making meat minty or adding a pinch of pique to pasta is a challenge our chefs love to undertake. The work we do in our kitchen reduces preparation time in yours and increases the shelf life of your products. Using traditional cooking methods, we have earned our treasured reputation as a leading food manufacturer for the UK and Europe and we truly believe that our passion for food and hand-cooking style sets us apart from competitors. Our ambient range has established us as market leaders. Contact us for top quality food produce combined with outstanding customer care.